One of the most vital components of your car that keeps your valuables locked away, trunks can also be a major source of unanticipated problems. How? Imagine locking your keys inside the trunk accidentally. If you carry a spare, then this situation might not seem like a big inconvenience, but what if you don’t? With access to your trunk and car taken away, there’s only one solution – you need to get the help of a locksmith and you need it fast. 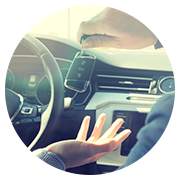 Safe Key Locksmith Service has been helping clients deal complex automotive lock and key issues for over a decade in Chicago Heights, IL area. If we’ve solved their problems, we’re sure we can find a solution to yours too! At Safe Key Locksmith Service, we’ve dealt with numerous trunk lockout situations in Chicago Heights, IL area and have helped clients out of it without damaging the vehicle. Whether you’ve lost the trunk keys and need a new key or you need to retrieve your car keys from a locked trunk, our trunk unlock service can effectively deal with it all!